Mrs. Guimara Tuñón Guerra is the current Director General of Ports and Maritime Ancillary Industries of the Panama Maritime Authority. 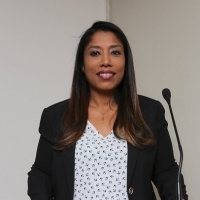 Mrs. Tuñón-Guerra has more than nine (9) years of experience in the maritime sector, in both public and private sectors, in maritime transportation, logistics, maritime business administration, as well as in port issues. Ms. Tuñón- Guerra has a Law Degree, two Master’s Degrees, one in Port Management and Logistics, and the other in Port and Maritime Management, as well as a Doctorate Degree in Engineering and Architecture. Prior to becoming Director General, she served as Deputy Director of Maritime Ancillary Industries, overseeing issues related to the granting of Port Concessions and issuance of Operations’ Licenses for Maritime Ancillary Industries purposes. In 2017, she was elected Vice President of IAPH (America, Central and South Region).